A General History of the Robberies and Murders of the most notorious Pyrates is a 1724 book published in Britain containing biographies of contemporary pirates, which was influential in shaping popular conceptions of pirates. It is the prime source for the biographies of many well known pirates. Its author uses the name Captain Charles Johnson, generally considered a pseudonym. The author has remained unknown in spite of numerous attempts by historians to discover his identity. Many scholars have suggested that the author could have been either Daniel Defoe or publisher Nathaniel Mist (or somebody working for him). Recently, Arne Bialuschewski of the University of Kiel in Germany has identified a far more likely candidate: Nathaniel Mist, a former sailor, journalist, and publisher of the Weekly Journal. The book's first publisher of record, Charles Rivington, had printed many books for Mist, who lived just a few yards from his office. More importantly, the General History was registered at Her Majesty's Stationery Office in Mist's name. As a former seaman who had sailed the West Indies, Mist, of all London's writer-publishers, was uniquely qualified to have penned the book...Mist was also a committed Jacobite...which could explain the General History's not entirely unsympathetic account of the maritime outlaws. 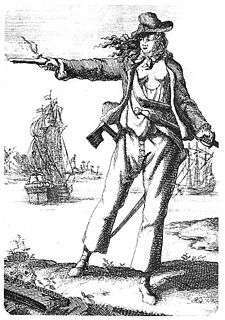 A General History introduced many features which later became common in pirate literature, such as pirates with missing legs or eyes, the notion of pirates burying treasure, and the name of the pirate flag the Jolly Roger. 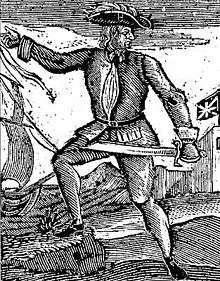 The author specifically cites two pirates as having named their flag Jolly Roger (named after the first Pirate and his crew): Welsh pirate Bartholomew Roberts in June 1721, and English pirate Francis Spriggs in December 1723. The book gives an almost mythical status to the more colourful characters, such as the infamous English pirates Blackbeard and Calico Jack. It provides the standard account of the lives of many people still famous in the 21st century, and has influenced pirate literature of Robert Louis Stevenson and J.M.Barrie. The book was released in two volumes. The first mostly deals with early 18th-century pirates, while Volume II records the exploits of their predecessors a few decades earlier. In the first volume, the author sticks fairly close to the available sources, though he embellishes the stories somewhat. He stretches the truth farther in the second volume, and includes the biographies of three subjects who may be entirely fictional. The book has been hugely influential in shaping popular notions of piracy. as well as biographies of the probably fictional captains James Misson, Lewis, and Cornelius. 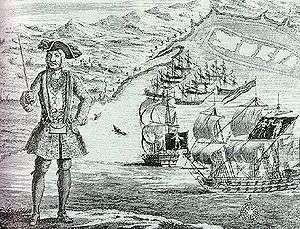 ↑ A general history of the robberies & murders of the most notorious pirates. By Charles Johnson Introduction and commentary by David Cordingly. Conway Maritime Press (2002). ↑ Ossian, Rob. "Book Review:A General History of the Pyrates". The Pirate King. Archived from the original on 22 October 2007. Retrieved 2007-11-29. ↑ Woodard, Colin (2007). The Republic of Pirates. Harcourt, Inc. pp. 325–326. ISBN 978-0-15-603462-3.